You are currently browsing articles tagged Eagle. There is SO much to do this weekend! Below are just a few fun ideas. Sister Bay invites you and your family to “Unplug & Play” family sports day on June 24 heralds the beginning of summer and provides an opportunity for everyone to get outside, enjoy life, check out our beautiful public beach, and all that’s new in the village. The annual Paddlefest event, Disc Golf Tourney, Morning Yoga on the Pier and free volleyball is a great way to Unplug & Play! Celebrate the 15th anniversary of this event with music, food, beverages, an auction, raffle and more! Enjoy an evening strolling through the village at Old World Wisconsin while sampling foods and enjoying music on four different stages. Tickets are required and can be purchased at the door. Enjoy chicken, live music and lots of fun activities this weekend in Appleton. Kids will enjoy the rides and amusements in the park. Find your fitness at the ChickenCase 5K or Zumba in the park. The packed schedule also features fireworks on Friday night, pizza eating, chicken dance and tractor pulling contests and more! Celebrate Cedarburg’s 32nd Annual Strawberry Festival, Saturday, June 24 and Sunday, June 25. This free, family-oriented festival is a favorite of many, drawing up to 100,000 people annually. Vendors will be selling Strawberry Brats, Strawberry Shortcake and Strawberry Chicken Wraps, and strawberries by the quart. Event kicks off with a run on Saturday morning. Enjoy music, art and activities throughout the festival or stop by the Sunday morning all-you-can-eat “Strawberry Pancake Breakfast,” 8am-11am, at Cedar Creek Settlement. Start the the Independence Day celebrations early at Shake the Lake – a community-focused summertime festival in Madison, Wisconsin. The free outdoor celebration features a variety of family-friendly events and activities along the beautiful Lake Monona. Festival goers can enjoy an assortment of delicious food and beverages as well as live music, a roller derby game, a bike polo exhibition and a show-stopping fireworks display. Navarino Wildlife Area. Ski or snowshoe the one mile loop. Other dates available, please see their web site. Kettle Moraine State Forest. Almost a mile and half of trail lit by over 400 candles. Bonfire & hot drinks available, but it’s BYOM (bring your own marshmallows)! Chippewa Moraine Ice Age Trail. 1-2 hour long snowshoe hikes led by naturalists. Snowshoes available for no charge, donations appreciated. Red Cedar State Trail & Stokke Trail. Begins at the Menomonie Depot, bonfire & hot cocoa to warm you up at the end. Hartman Creek State Park. Free cookies, cider and hot cocoa provided. MECCA Nordic Ski & Hiking Trails. Begins at Little Turtle Flowage Trailhead at 6 pm. Lake Wissota State Park. Snowshoe, ski and walking trails will be lit and snowshoes are available for rent. Whitefish Dunes State Park. Cookies and hot drinks available at the picnic shelter along with a warming fire. North Lakeland Discovery Center. 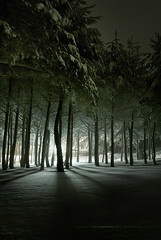 Leisurely walk in the light of a full moon, snowshoes available for rent.